You can use the Azure Cloud Shell or a local installation of the Azure CLI to complete this quickstart. If you'd like to use it locally, version 2.0.55 or later is recommended. Run az --version to find the version. If you need to install or upgrade, see Install Azure CLI. Azure container instances, like all Azure resources, must be deployed into a resource group. Resource groups allow you to organize and manage related Azure resources. Now that you have a resource group, you can run a container in Azure. To create a container instance with the Azure CLI, provide a resource group name, container instance name, and Docker container image to the az container create command. In this quickstart, you use the public mcr.microsoft.com/azuredocs/aci-helloworld image. This image packages a small web app written in Node.js that serves a static HTML page. You can expose your containers to the internet by specifying one or more ports to open, a DNS name label, or both. In this quickstart, you deploy a container with a DNS name label so that the web app is publicly reachable. Execute a command similar to the following to start a container instance. Set a --dns-name-label value that's unique within the Azure region where you create the instance. If you receive a "DNS name label not available" error message, try a different DNS name label. When you run the command, the container's fully qualified domain name (FQDN) and its provisioning state are displayed. If the container's ProvisioningState is Succeeded, navigate to its FQDN in your browser. If you see a web page similar to the following, congratulations! You've successfully deployed an application running in a Docker container to Azure. If at first the application isn't displayed, you might need to wait a few seconds while DNS propagates, then try refreshing your browser. When you need to troubleshoot a container or the application it runs (or just see its output), start by viewing the container instance's logs. The output displays the logs for the container, and should show the HTTP GET requests generated when you viewed the application in your browser. In addition to viewing the logs, you can attach your local standard out and standard error streams to that of the container. The mycontainer container should not appear in the command's output. If you have no other containers in the resource group, no output is displayed. 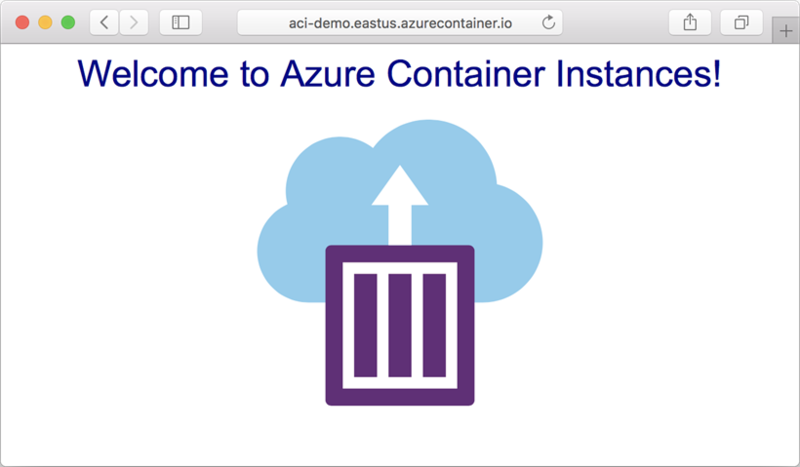 In this quickstart, you created an Azure container instance by using a public Microsoft image. If you'd like to build a container image and deploy it from a private Azure container registry, continue to the Azure Container Instances tutorial. To try out options for running containers in an orchestration system on Azure, see the Azure Kubernetes Service (AKS) quickstarts.